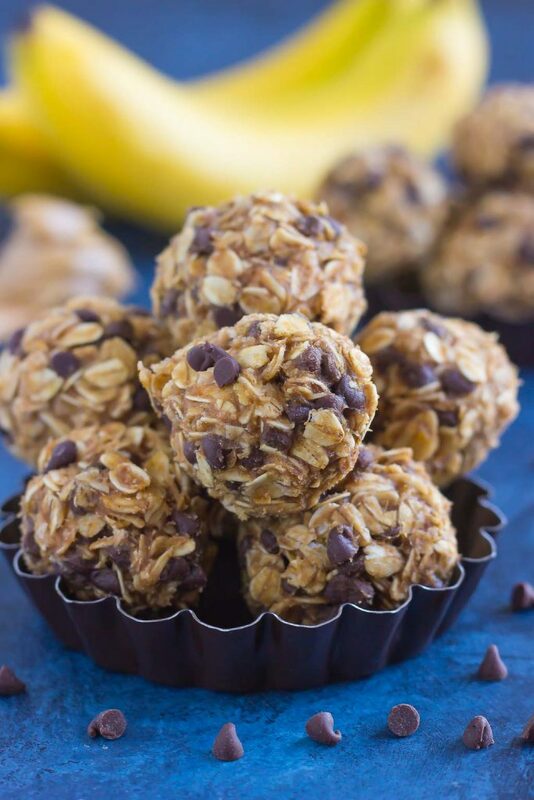 Packed with hearty oats, creamy peanut butter, bananas, and a sprinkling of chocolate, these no-bake Peanut Butter Banana Energy Bites make the perfect, on-the-go breakfast, snack, or even dessert! Let’s start our day off with some peanut butter, shall we? Well, peanut butter and bananas, because that’s a winning combo in my book. Have you ever had a grilled peanut butter and banana sandwich? Oh man, is that good! I think that was Elvis’s choice of sandwich, am I right? Or maybe there was bacon in it, too? I can’t remember, but either way, I love creating a grilled sandwich like that if I want to forgo a regular grilled cheese. Can you tell that I have grilled peanut butter sandwiches on the brain? That’s where I got the idea to make these Peanut Butter Banana Energy Bites, just incase you couldn’t tell. While there’s no bread (or bacon!) in these bites, they’re full of flavor and on the healthier side. 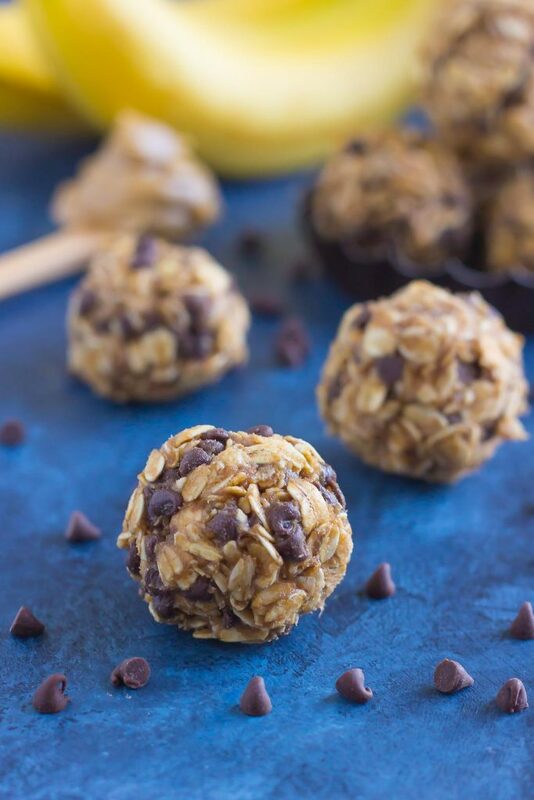 Packed with hearty oats, creamy peanut butter, bananas, and a sprinkling of chocolate, these no-bake Peanut Butter Banana Energy Bites make the perfect, on-the-go breakfast, snack, or even dessert! That’s right…chocolate and peanut butter cane be combined into something healthier, that still has a decadent flair. And did I mention that these cuties are good for you? Chia seeds and honey also make up these bites, giving them a boost of fiber, vitamins, and minerals. 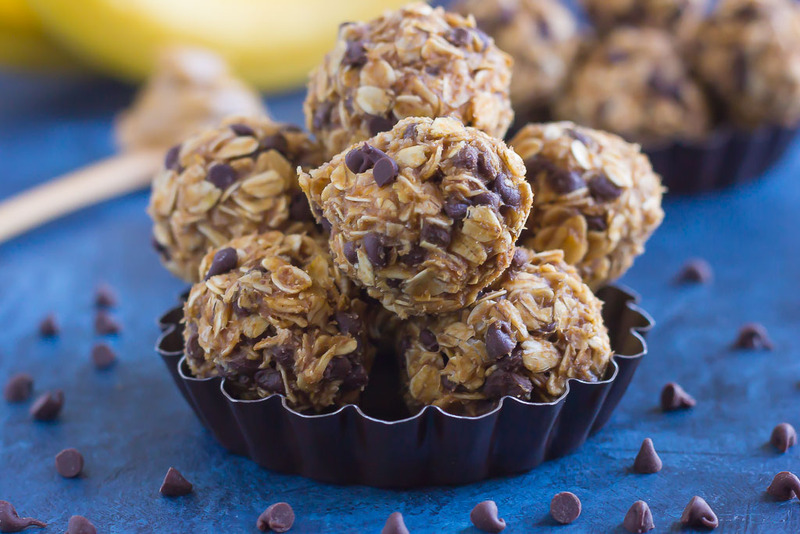 And, you guessed it…these Peanut Butter Banana Energy Bites are so easy to make! Since they’re no-bake, it requires less than 10 minutes of prep and a little time to chill in the fridge. Easy peasy, friends! So, whether your New Year’s resolution (or in my case, goal) is to eat a bit healthier, or if you just adore peanut butter and banana together like I do, this healthier snack was made for you. 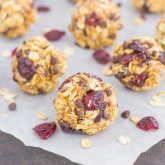 Easy to make and even better to eat, you’ll be munching on these bites for breakfast or a mid-morning snack! 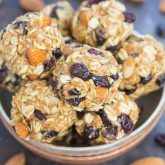 Looking for more energy bites? I’ve got you covered! In a large bowl, combine the oats, chocolate chips, and chia seeds. Set aside. In a small, microwaveable bowl, add the peanut butter and honey. Microwave for 15-20 seconds, or until peanut butter melts slightly, so that it is easier to stir. Remove from microwave and add in vanilla extract and mashed banana. Stir thoroughly until mixture is smooth. Pour peanut butter mixture over oat mixture and stir to combine, ensuring all of the oats are covered. If the mixture seems too wet, add 1 tablespoon (or more) of oats, until it comes together. Place bowl into refrigerator and chill for 15-20 minutes, so that mixture holds together and is easier to shape into balls. Hi! For some reason, the recipe is not showing up on my end. Could you please repost it in response to my comment? I made it last week and it was so delicious and want to make it again! Hi Rebecca! Sorry about that! There was a glitch. The recipe box should be there now. Thanks! I've never had a peanut butter and banana sandwich! I love both and eat regularly, but never in sandwich form. These look delicious and I've made your Blueberry Almond Butter Energy Bites before and they were a total winner so gonna have to try these. Like a little dessert, but good for you....my kinda treat :) Pinned, of course. P.S. Bacon in that sandwich sounds like it would be SOOOOO good! Hope your week is going great, my friend! Thanks, Blair! I love no-bake anything, especially in energy bite form. I'm sure your kids would love this! totally agree that peanut butter + bananas = a winning combo!!! and love the chia seeds in here too! yummm!! Now that these would make a afternoon nice pick me up on a hectic day. I'm totally intrigued by the mashed banana in these -- a great healthy "glue"! We are big banana and peanut butter lovers here. The kids will love these! I love your thinking! It's definitely healthy glue! :) Thanks, Ashley! this most definitely is a wonderful combination! yum! I had a peanut butter banana panini at a coffee shop in Boston and it was incredible! I haven't made it at home yet and really need to that. 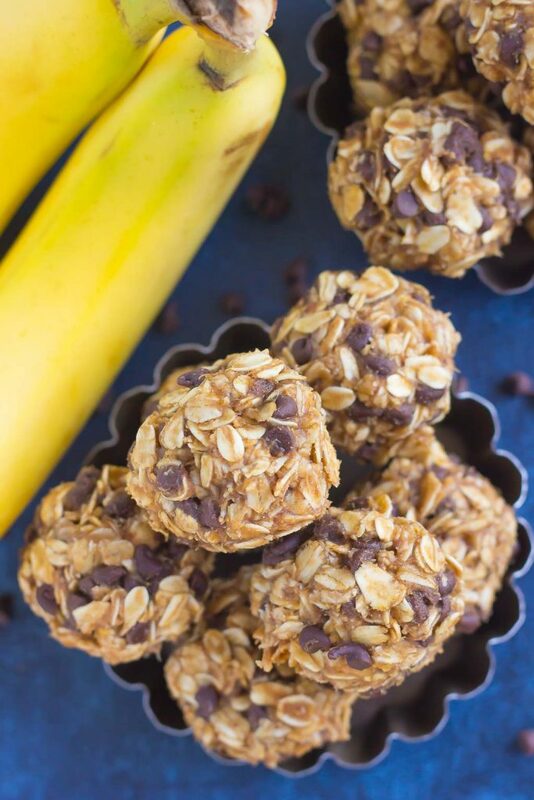 :) I love energy bites like this and incorporating banana was a great idea -- I can never get enough of that flavor combination! I always have overripe bananas lying around, so this will be the perfect use for them! Oh that panini sounds fantastic! I love sandwiches like that! Thanks for the kind words, Marcie! What coffee shop was this, Marcie? I love the combo and have recently moved to Boston! It's been a while since I've had one but a grilled peanut butter & banana sandwich sounds SO good right now! Love that you made an energy bite version. These are the perfect grab & go snack! Thanks, Kelly! I've been eating these all week long! I've been going crazy over energy bites lately! Peanut Butter, banana, and chocolate is seriously one of my favorite combinations! I can't wait to try these! Thanks, Michelle! Aren't energy bites the best?! These look amazing and there's something about the peanut butter and banana combo that is just fantastic. love the pictures too. OMG, I need to make these! Never had this combination in energy bites! And I need to make that sandwich! Sounds awesome! Pinned! Thanks so much, Mira! It's my new favorite energy bite! Oh gosh, I would be eating SO many of these and I don't see myself being able to stop either!! You just can't go wrong with the winning combo of peanut butter, banana, and chocolate! It's always a good day when the day starts with peanut butter! I LOVE energy bites and banana + peanut butter?? Yes yes yes! Have a great rest of the week Gayle! Banana and peanut butter are the best, right? Thanks, Ashley! Thanks for the sweet comment and pin, friend! I totally agree that peanut butter makes every day better! I'll happily start and end my day with peanut butter! This is a snack I can get behind!! YUM! I absolutely love grilled peanut butter and banana sandwiches! I'm kicking myself for forgetting bananas at the store today.. totally gotta go back! 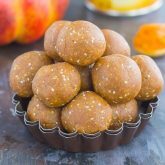 These energy bites look like the perfect way to enjoy that peanut butter/banana combo, and I could totally use some energy right now. Pinned! This sounds delish!! A quick question, can I use natural peanut butter and Quaker quick oats? Hi Kathy! I've never tried this with natural peanut butter or the quick oats, but I think it would work just as well. 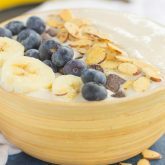 The texture might be a bit different by using quick oats, but I think it would still be good. Hope you enjoy this and thanks for stopping by! Hi Beckey! You can store these in the refrigerator for up to two weeks. I made these last week Gayle and they were SO good! My kids and I devoured them and I'll definitely be making them again soon. It's such a great recipe to help me use the overripe bananas on my counter! Do you know how long these keep, or how soon after making they should be consumed? Hi Julie! I've kept these in the fridge for up to five days and they tastes delicious! If you want to keep them longer than a day or two, I would suggest storing them in the fridge. Hope this helps and enjoy! These sound delicious! any idea what the calories might be per serving? Thanks! Hi Gloria! I don't count calories on my recipes since I don't want to lead anyone in the wrong direction and am not a dietician. However, there are calorie counters you can find online if you're curious. Hope you enjoy these if you try it! How long do these last if they're left in the fridge and about how many calories per ball? Hi Sadie! These will last about 5 days in the fridge. I don't provide calorie counts, so I don't know that information, but there are plenty of calorie counters you can find online to help you. Hope you enjoy! Sorry about that, Kat! I know there are calorie counters you can find online. So glad you enjoyed these and thanks for stopping by! Do you think making these into bars and freezing them for later consumption would work well??? Thanks! Hi Amanda! I've never tried making these into bars, so I'm really not sure how it would turn out. I'm guessing it would work because the energy bites are pretty firm once refridgerated, but that's just a guess. Hope you like these if you try it and thanks for stopping by! I'd love to know how they turn out if you do freeze them! How long do these last in the refrigerator? Do they last a couple of days or weeks? Hi Sandra! I've kept this in the fridge for up to one week and they tasted great. Hope you enjoy and thanks for stopping by! Just made these and added some ground flaxseed and cinnamon- yummy! I'm so glad you liked these, Michele! Flaxseed and cinnamon is a great addition! Thanks so much for stopping by! Hi Jennifer! I'm not sure what happened, might've been a glitch. But if you scroll down towards the bottom of the page, the recipe box is there with the instructions.